Currently, if you want to share a Pandora station or song with a friend, you have to email it to them. Last time I checked, this isn’t 1994. Tonight, Pandora is joining the 21st century with the addition of simple ways to share stations and songs on Twitter and Facebook. 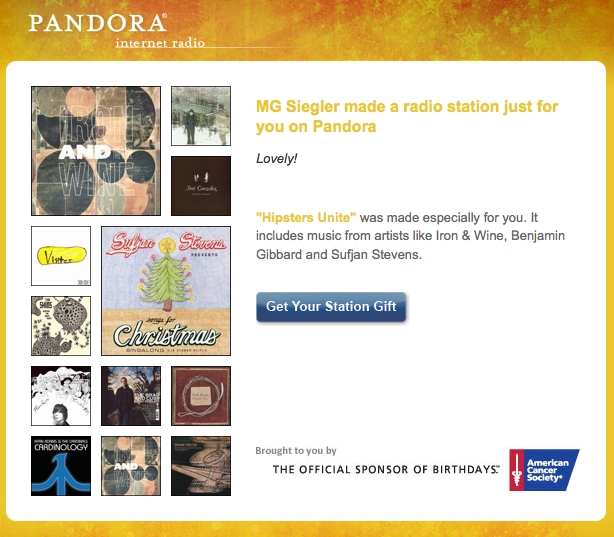 And it’s further emphasizing a feature that no one seems to realize exists: Gifting Pandora stations. 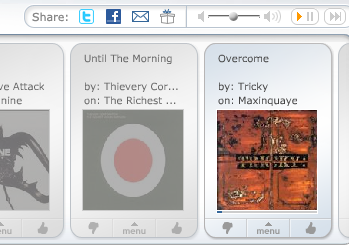 On Pandora’s main playback pages you will now see a new set of buttons next to the traditional playback ones. These include a Twitter button, a Facebook button, a mail button, and a gift button. Clicking on any of those allows you to send the current station or current song you’re listening to via those respective services. 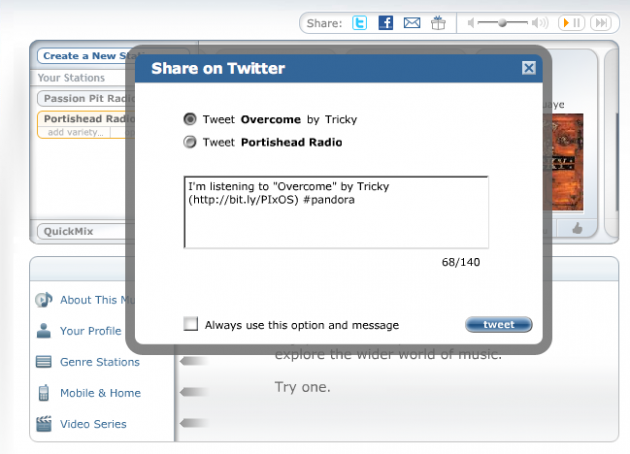 For Twitter, Pandora is using the API to launch its own tweet box that allows you to select whether to tweet the song or the station, as well as edit your 140 character message that is being sent. If you’re going to be tweeting a lot and don’t feel like doing this over and over again, you can select “Always use this option and message” and Pandora will remember it, allowing you to skip that step. 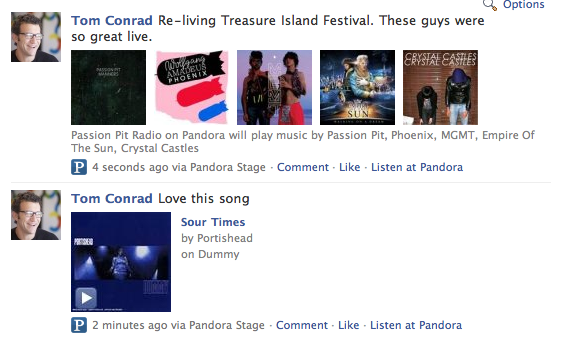 For Facebook, Pandora uses Connect to allow you to post songs and stations to your Facebook profile and News Feed. You’ll also be able to play song previews (30 seconds) right inline on Facebook. For the gifting feature, Pandora takes you to a page that allows you to create a customized station based on either an artist or a song. You can choose up to 5 artists or songs for one station. You then name the station, choose a skin for the message, and enter the email addresses of those you wish to send it to, along with a personal message. This gifting feature, which has existed in the past, but was previously hard to find, is totally free. And it will feature a new holiday option when that time of year rolls around, we’re told. “It’s sort of our version of making a mix tape for someone,” Pandora CTO Tom Conrad tells us. And it’s another another way to monetize a bit better. When a user receives the gift email and clicks on the link, they are taken to a gift mix custom page that is sponsored. From there, a user has to click one more time to launch their station. When users on Facebook and Twitter click on the Pandora links sent out, they’ll be redirected to a redesigned landing page that will allow them to either play a 30 second preview of a song (if it was a song that was sent out) or a link to launch the Pandora station (if it was a station that was sent out). If it’s the former, there is also a big button to create a new station based on that song. So why is Pandora doing this? Well obviously moving into the 21st century where people share via Twitter and Facebook rather than email should help increase usage. But Conrad is quick to note that sharing is the key to this, not massive viral tweeting. There will be no auto-posting to Twitter nonsense, we’re told.